In this section, we will learn about the construction of ogive or cumulative frequency curve and cumulative frequency polygon. There are two methods of constructing frequency polygon and cumulative frequency curve but the techniques of drawing it is same. First prepare a less than type cumulative frequency table. 1)	On the x – axis use the upper limits of the class. 2)	Mark the less than type cumulative frequency on y – axis. 3)	Plot the points using upper limits and corresponding cumulative frequencies. 4)	Join the points by a free hand curve to get ogive and to get the cumulative frequency polygon join the points by line segments. First prepare a more than type cumulative frequency table. 5)	On the x – axis use the lower limits of the class. 6)	Mark the more than type cumulative frequency on y – axis. 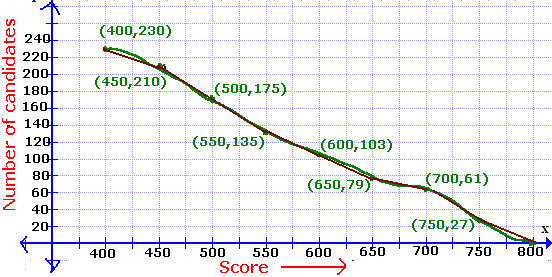 7)	Plot the points using upper limits and corresponding cumulative frequencies. 8)	Join the points by a free hand curve to get ogive and to get the cumulative frequency polygon join the points by line segments. 1)	Draw cumulative frequency curve and cumulative frequency polygon for the frequency distribution by less than type method. From the above the red free hand curve is ogive and green line segment is frequency polygon. 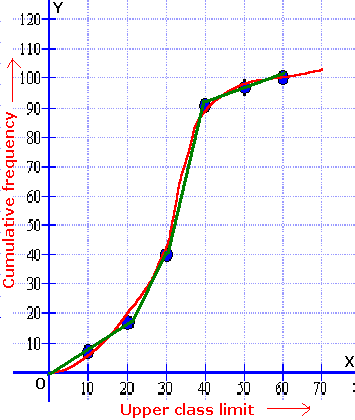 Draw cumulative frequency curves by more than method on the same axes. Also, draw the cumulative frequency polygons. Brown line represents Frequency polygon and Green curve represents frequency curve.